Every house contains a basement. Sometimes the basement is abandoned, while it can serve as an extra room by the right decorating and enlarge your house space. So be smart and get ready to decorate your basement to be your charming extra room. 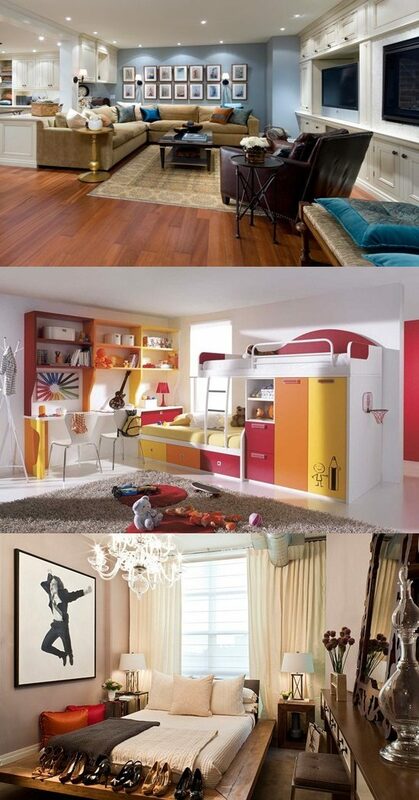 You can use it as bedroom, playroom, music room and more. If you decide decorating your basement as a bedroom, it will be a fun task when you do it yourself with your family. You need the basement to be cozy and enjoyable bedroom. Thus, you need to consider some tips to create your wonderful bedroom. First, measure and inspect your basement to fix anything needs to be maintained, after measuring the basement size, now come the time to design and decorate the basement. The color is essential element to consider for creating a cozy feel. You need to pick a light color which will make your basement seem bigger. You shall make a trick by the color; paint a one wall by dark color and the others by lighter color which will make the room comfortable and it will lighten up your bedroom. Then, the basic element to fresh your room is to install the right light fixtures. The wall sconces may fit the small basement to enhance its look. If you need a colorful atmosphere you shall go for string lights while if you need a soft and romantic atmosphere you may go for Globe Lights. After deciding the right light, then you need to install wooden floors to enhance the look and to be practical too, or you can use a tile floors with a cute rug on it, but it depends on your taste. Next step is to choose the right furnishing for your basement, don’t overwhelming the room with furniture and try to use comfortable furniture with some colorful pillows. Try to place the furniture by a decorative way to make the bedroom look large. Bed, sofa and chairs will be practical and cozy with few nice accessorizes. By these simple tips you will get a wonderful bedroom inside the abandoned “basement”.